High-fives for the 05ers: Jhon Cordoba (l.) and Jairo Samperio (r.) celebrate victory for Mainz over Augsburg. 1. 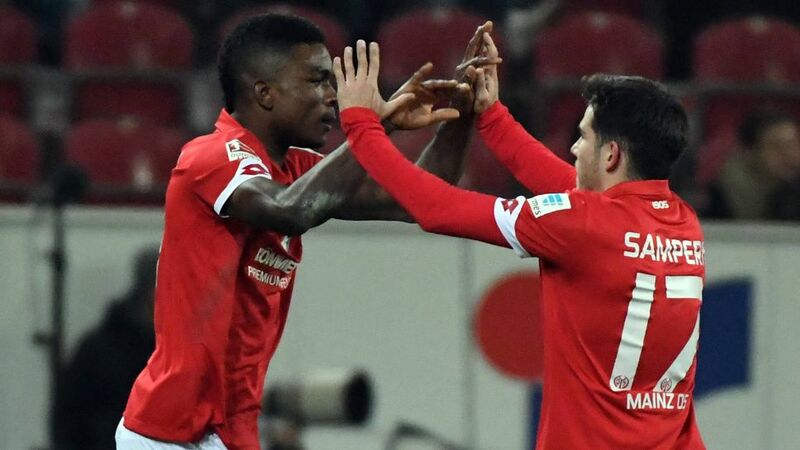 FSV Mainz 05 pulled into the top half of the Bundesliga table – for 24 hours at least – with a 2-0 win over FC Augsburg. Levin Öztunali and Jairo Samperio got the goals at the OPEL ARENA. Öztunali is an Official Fantasy Bundesliga steal at 10M. Snap him up here! Mainz dominated possession for the opening half-hour, yet it was on the counter-attack that they broke the deadlock. Andre Ramalho picked out Jhon Cordoba, the Colombian headed into Öztunali’s path, and the midfielder made no mistake from close range. Raul Bobadilla flashed a volley over the bar at the other end before the teams went in for half-time. Mainz doubled their advantage inside the hour. Again Cordoba proved the source of the problem for Augsburg, bursting into the box and drawing a penalty from visiting ‘keeper Marwin Hitz. Jairo then stepped up to send Hitz the wrong way for 2-0. Mainz put their foot on the ball from there, frustrating Augsburg to ensure all three points. This was Mainz’s first win in five Bundesliga games. The 05ers have struggled for consistency this season, but with Cordoba, Öztunali and now winter signing Bojan adding verve to his attack, coach Martin Schmidt will be hopeful his side can keep climbing towards the European places. Öztunali is enjoying his most prolific season to date, with three goals and three assists to his name.There has never been a goalless draw between Mainz and Augsburg. Mainz are unbeaten in their last seven against Augsburg (W6, D1), scoring 20 goals in that time. Click here for the Mainz-Augsburg Match Centre!